Patents that will help you see clothing modeled by a 3D version of your own body. 3D capture and 3D modelling company Body Labs is already one of the leading names in capturing and analyzing the human body’s shape and transforming it into fully-manipulable 3D assets. Their technology uses advanced software and algorithms to convert a standard 3D scanned body into a mathematically-accurate, 3D digital avatar that can be posed, animated or analyzed. Their already impressive technology is about to get a boost thanks to a new agreement that grants them exclusive rights to a pair of Brown University-held patents and licenses for several new 3D technologies developed by Max-Planck-Innovation GmbH. Body Labs’ ability to create accurate 3D models of the human body using data captured from a variety of sources will be expanded with the addition of U.S. Patents 9,189,886 B2 and 2013/0249908 A1. The patents include proprietary technology developed using research conducted by computer vision scientist Michael J. 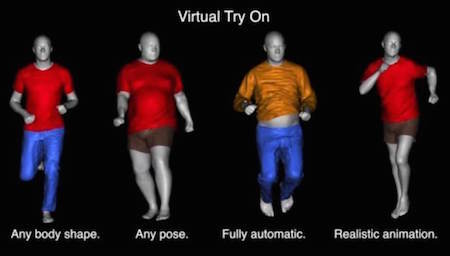 Black that allows the generation of 3D avatars capable of realistic and anatomically accurate movements and poses using a statistical model of human shape, pose and motion. The Body Labs process uses machine learning algorithms and a comprehensive set of human shapes and poses to convert measurements or scans into statistically-accurate body geometries. "In your days they showed you a fashion-plate," said the tailor," but this is our modern development See here." The little figure repeated its evolutions, but in a different costume. "Or this," and with a click another small figure in a more voluminous type of robe marched on to the dial.